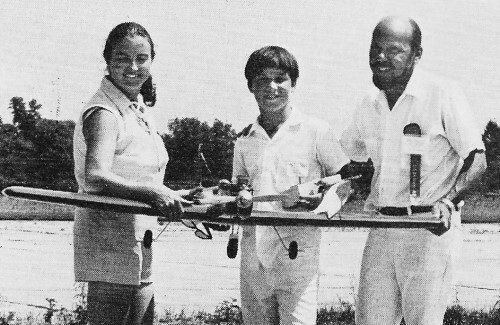 Website visitor Doug H. wrote to ask that I check for information on a couple people in particular who participated in the Radio Control portion of the 1971 and 1972 AMA Nationals competitions. Rather than just do that, I went ahead and scanned and posted the entire articles so that all the available information could be seen. I figured there may well be others who would like to have that information available. 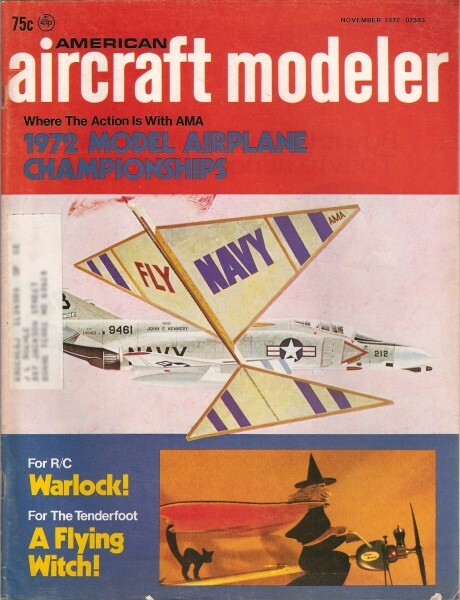 The November issues of American Aircraft Modeler were typically where NATs coverage was first reported (the 1971 R/C NATs info can be found here). Nowadays, when the NATs are held in the late July to early August timeframe, it is not unusual to begin seeing coverage by the September issue of Model Aviation. The lead times to press are much shorter now thanks to computerization and modern printing methods. Lag time of more than a couple months is due primarily to authors not getting their copy to the editors early enough. RC at the '72 Nats was many things for many people. For some it was joy-making the finals in Class C or Formula I or FAI Pylon and for many more others failing to do the same. Winners are always happy; losers, some bitter, some expect it, some shrug it off, wait till next year! But the name of the game, in no matter what kind of competition, is winning! All strive for victory - some more than others - and tremendous preparation is in evidence everywhere! AMA President John Clemens presented Outstanding Service Award Plaques to the Navy Nats Project Officer, Lt. 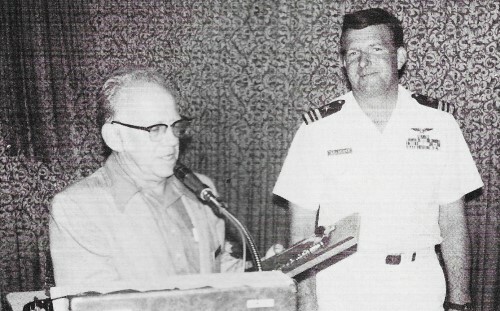 Commander Al Geimer (right) and his assistant, Lt. Commander Bob Needham. 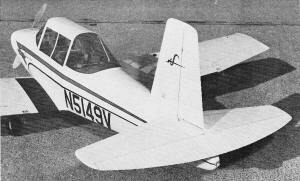 Bob Smith's T-2A designed by Tom Atktns. Bob will kit this ship. Notice the drooped aileron. Ship has coupled ailerons/flaps. Works very well. Josh Titus' magnificent and fine flying Ansaldo. It drops pilot by parachute and a bomb. Ralph Jackson beside his Weindecker Eagle. Retracts to be added for next meet. All plastic real plane very suitable for modeling in scale. No rivets or joint lines. Don Botteron's "paint brush" special, Akrobat, painted with a brush believe it or not. Claude McCullough's very nice Shinn. Notice the detailing. 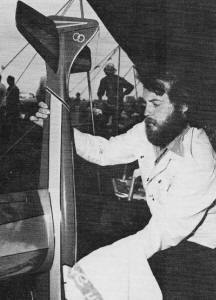 Charley Kenney wipes oil from The Pathfinder. 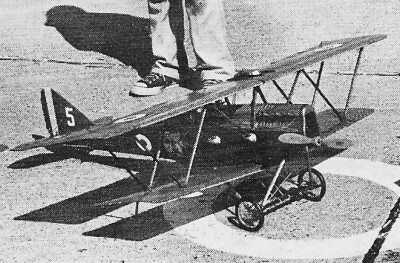 An uncomplicated Ryan M-1 Mailplane ready to start. The "Doc" Brookes family. Young 12-year­old Steve won Class A with some very impressive flying of his Kaos. Powered by HP 60 and controlled by Pro-Line. 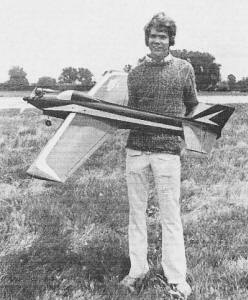 Steve has been flying RC two years and won his first contest a year ago. A very rainy day during pattern prelims. Flying in the rain ain't much fun, but fly we did. Ed and Louise Izzo do their thing. Jimmy Grier gets his "kicks" out of a Norm Page Mach 1 these days. Jimmy is always a tough competitor. Young Rhett Miller, only 14·years·old, came within a whisker of qualifying for Class C top 20! A Kirkland-designed Intruder. Jim Bonanno's replica of the WW II German Stuka JU-87 diver bomber. The big winners in Class C: Jim Whitley (2nd), Ron Chidgey (1st for the second time) and Don Coleman (3rd). Note that Jim was flying Ed Keck's ship as a backup when his own was splattered due to radio interference. 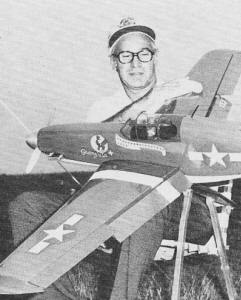 Leon Shulman flew Top Flite kit P-51 Mustang in pattern until a glitch destroyed this fine ship, retracts and all. Preparation achieves, but what about Lady Luck? 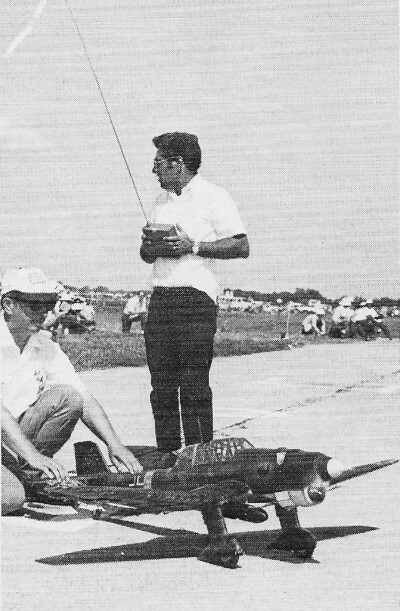 It struck down almost randomly: Jim Whitley and Jim Kirkland due to an unfortunate frequency mix-up; Whit Stockwell and John Agee plus two others due to mid-air collisions; Bob Smith with the fastest qualifying time in Formula I racing dropped out of the finals due to equipment problems; Telford and Violett with the fastest FAI racing qualifying times were also struck down in the finals by engine and other problerns. Misfortune is very unforgiving as there is not much room these days for error; one missed pylon heat or pattern flight can change the whole picture. 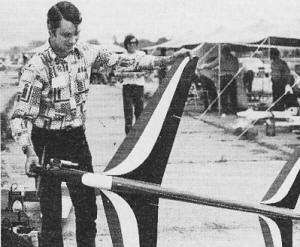 Some were able to rise above misfortune: Whitley finished second in C Pattern with a ship he had never before flown, borrowed from Ed Keck; Jim Kirkland with an airplane borrowed from Rhett Miller also never flown before by Jim; John Agee rose from the ashes of a mid-air and made the Class C finals with a borrowed airplane test flown in the rain. RC at the '72 Nats was flown in conditions ranging from absolutely miserable hot and humid weather, to cool and very wet, to perfectly beautiful, sunny and calm. Something for everybody. I had never flown competition in the rain before, but I sure did this year. Two flights in the driving rain. It sure is hard to see that airplane with the rain beating in your face! Equipment operation was fantastic, until a drop of water got in the wrong place - just ask George Hill! "Fair weather" George was surviving okay, until his ship did an uncommanded 90° turn, whereupon George shook the water out of his transmitter and continued with "come back here you ...!" Have you ever flown in a strong crosswind? Well, always expect it in Chicago at Glenview. Crosswind is S.O.P. and he who has not practiced under these conditions won't do so well. Evidence of experience under these conditions was present in the high finishers in Class C Pattern. The old rudder really gets a workout under crosswind conditions! Classes A and B were flown for a half day only (to the chagrin of the A and B fliers) under ideal conditions. Time was available for only three flights each - very unfortunate since Class C fliers had six qualifying flights plus six more to each of the top 20 qualifiers, Classes A and B were won by two youngsters whom I had the opportunity to judge, Young Steve Brooke, son of twice International Champion Ralph Brooke, took Class A Pattern in impressive fashion. This youngster has been flying RC for only two years and flew in his first meet just one year ago. The boy's technique, presentation and execution of maneuvers was far beyond h is tender years. 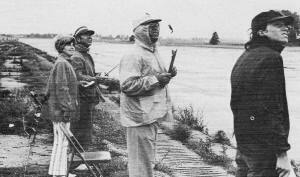 Also Ellis Newkirk from Nashville, winner of Class B, had all the style and skill of many oldsters. You can certainly expect a lot from these boys as they move into the advanced classes! Let's also mention 14-year-old Rhett Miller from Tallahassee, Florida. This boy placed second in Class C Novice and almost made the finals in Class C. He has been flying competition for only two years with two wins and a second in Class A, two wins in Class B, and two wins in Class C/D. Except for engine problems in two qualifying flights, Rhett would have been flying in the top 20 Class C finals at the Nats! What is a Nats without "Goldie" Goldclank doing his thing in Pattern and Pylon? This guy won't admit it and rarely shows it, but he is really a very good flier. Goldie's thing is not winning but having a good time in his own fashion and entertaining the crowd with his original (and unrecognizable?) maneuvers. Fun and laughter is Goldie's reward - too bad more of us can't be satisfied with that! 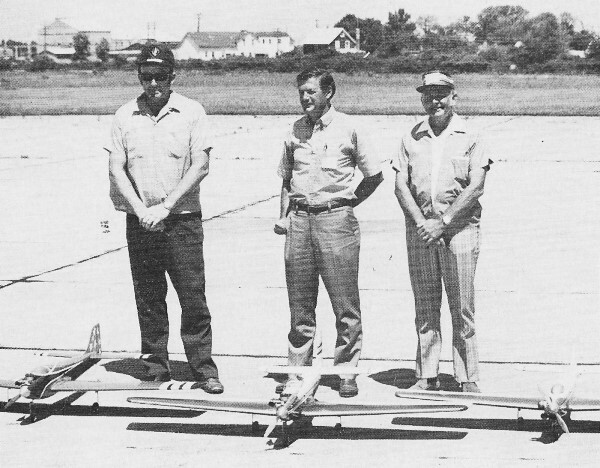 Horror of horrors, a Nats without Bill Bertrand's perennial monster scale Fokker D-7? 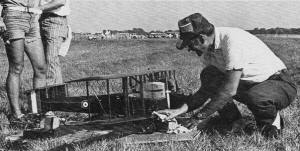 Bill showed up this year with a four-engine (count 'em) scale Handley Page biplane bomber, and it flew - precariously. Why must it be that Scale is fraught with near-disaster in flying most of these fabulous creations? I strongly -that we are placing too much emphasis on scale and not enough on flying. It takes one to two years to build a competitive scale ship and five seconds to wipe it out! This happened to several at this Nats. I don't have a final count, but many were damaged or lost including two beautiful Ray STs by young Bill and Jim Hiller - months of work down the drain! Stand-off Scale, here we come! Rarely have I witnessed a good scale-like flight in RC Scale and I didn't see one this year. 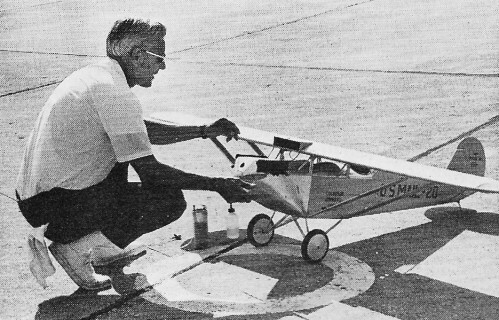 An interesting sidelight in Scale: Fred Stark placed only 19th in RC Scale with a cute McDonald Doodle-bug, but he was Scale category champion with firsts in Indoor Rubber Scale, Outdoor Rubber Scale, Navy Rubber Scale, second in Outdoor Gas Scale and 19th in RC Scale - now there is what I would call a Scale enthusiast! What about design and trends? Most Pattern ships seen at the Nats were fast and sleek, complete with super engines and "retracts. 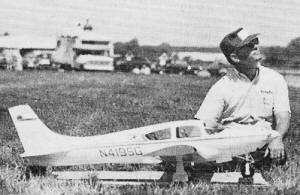 Phil Kraft tried to turn back the clock with his famous Kwik-Fli III and placed sixth. The fast aircraft definitely had an advantage in the windy weather conditions that prevailed during the prelims. However, slower ships such as Steve Brooke's Kaos looked very good in the calm air Sunday morning. A very interesting flap/aileron arrangement was used by both Bob Smith and Ed Hotelling on their Pattern ships. Bob says the flaps cut landing speeds in half! Bob flew a beautiful T-2A which he plans to add to his kit line. Du-Bro showed a very interesting muffler which was used by several contestants. It is a compact device made of perforated flat plates stacked together with spacers; it will soon hit the market. Fred Hartshorn flew a unique ship - very long fuselage, highly tapered wings and coupled flying stab and flaps! Now that was different! It was complete with retracts, 550 sq. in. and a Webra Blackhead - fast! Pylon was dominated by the new K&B Schneurle engine. "Over the Hill" Cliff Weirick showed them in Formula I with all firsts. Many of the California troops dropped out in the finals for one reason or another - mostly equipment or damaged aircraft. A downwind takeoff was the nemesis of several. 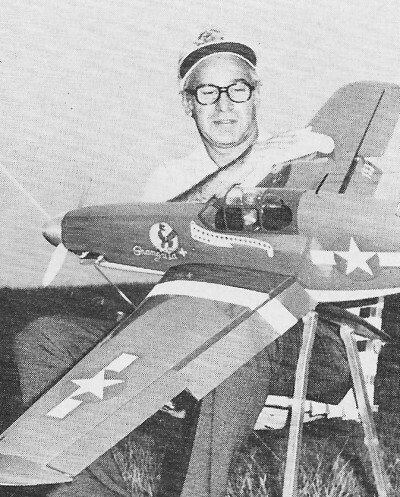 A near-disaster occurred when Bob Reuther's Minnow pranged into the crowd with equipment failure and New England's "Tiny" Rich escaped with a bad cut, bruises and shock. Tiny's buddy, Jerry Wagner, a potential winner due to a tremendous qualifying time, thereupon withdrew from the contest. Bob Stockwell did a great job calling the races. His expert patter added much to the activity. Helicopters are here! Informal competition and demos in the evenings brought out many originals and kit designs. 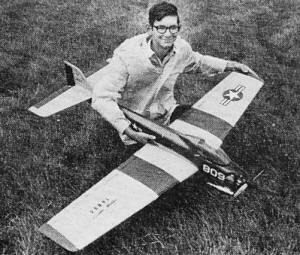 The most impressive (to me) was still the Schluter chopper flown by Horace Hagen. AAM's Ed Sweeney showed up with a very interesting variation on the Du-Bro Whirlybird soon to be an AAM feature. Windy conditions are still a strong deterrent to helicopter operation and proved to be the downfall of several, but progress has been remarkable! How does one sum up the '72 RC Nats? Memorable - the last (supposedly) Navy-sponsored Nats. Frustrating - same management errors here and there, I'm sure aided and abetted by lack of Navy help. Scary - the speeds of Formula I and FAI Pylon are almost out of hand. 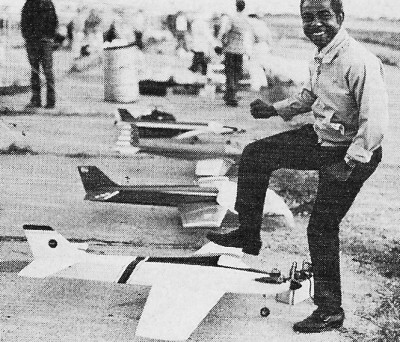 Satisfying - a demonstration of aircraft, design and performance; undreamed of when I first entered the hobby/sport. So into history we file the 1972 RC Nats. The most unique pattern ship there - Fred Hartshorn's Thunderball. Coupled flying stab and flaps, 12 to 9% wing, wing taper 13 to 4 in. tip, 550 sq. in., 7 1/2 lb., Rom-Air retracts. Really moved with a Webra Blackhead. Mike Mueller and his Mach 1 from Chicago. Also very close to qualifying for top 20 in Class C.
Scale winner in flight. Bud Nosen's highly detailed and colorful A-1 Skyraider which later crashed by control system failure. Bill Bertrand surprised everyone with a new ship - a Handley Page bomber. It was a handful to fly!